About a year ago I made the switch from Winsor & Newton Series 7 brushes (which I was using for several years then) to Rosemary & Co Series 33. I was very pleased with the brush, even with shipping included they were less than 75% of the price of a W&N brush. The only thing that I had had to get used to was the shorter and thinner handle. Loyal readers of my blog might remember I positioned the Rosemary & Co brushes on number 6 in my top 10 of 2009. Shortly after writing that article I ordered some more Rosemary brushes. I've been using them intensively over the past few months but for some reason I wasn't as happy with them this time. From the 3 brushes I ordered one of them had a point which was splitting all the time. The points of the other ones weren't as crisp either. One of my retired W&N brushes even had a better tip still! And picking up that brush again was such a difference: the slightly thicker and longer handle really makes a difference when handling it. This made me decide to take W&N in consideration again. Okay they are expensive, but quality comes with a price. And since the brush is the most important tool for miniature painting I'm prepared to pay for the superior quality of a W&N Series 7 brush. 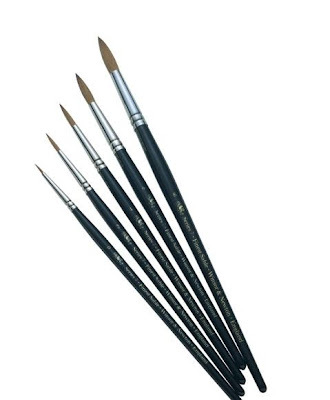 I've ordered a batch of 4 #1 brushes (depending on how much I paint my brushes last about 6 months) from Ken Bromley Art Supplies today, since they are running a 50% deal this week. I've also thrown in a some brush cleaner and color wheel. Lessons learned? For me: "never change a winning team" sounds very appropriate. I was completely happy with my W&N brushes in the past so why did I switch to another brand? The lesson I have for you is don't save money on a brush. It's the most important tool on your desk and yes, you will paint better with a good brush. W&N Series 7 are probably the best brushes out there. If you do not want to pay the price be sure to check out Rosemary & Co, they're actually very good and far better than anything you will find in the average gaming or modelling store. EDIT: okay some comments and I want to add one important thing for those who want to buy Rosemary or W&N brushes, which aren't cheap of course. If you know you won't take proper care of your brushes, this means washing them out after every painting session, storing them properly, handling them with care while painting, then don't waste your money on them. They wear out as fast as any other cheaper brush, it's only when they're in perfect shape that they perform as they should be. I can usually get a brush to last a year or more, hoever, and am a great fan of "the masters brush cleaner and preserver" try it, it's amazing. I have however never tried the series 7 "miniature" brushes, and would be interested to hear from someone who has. I have at least three W&N Series 7 brushes, but feel that I'm too clumsy or (truthfully) don't look after them well enough. I have been using the new Games Workshop brushes (particularly the Standard Brush) and feel more comfortable with these. If I miss handle them or abuse them, I don't feel guilty! I know that W&N brushes are SOOOOO much better than the GW or even the other cheaper brushes I have , but the cost and my tendency to NOT LOOK AFTER them means that I will still keep the W&N brushes for best - that translates to; Never use them, rather than 'bit the bullet' and scrap all of my lesser brushes. Just a personal view, and I appreciate your comments about Rosemary's Brushes. I have often thought about picking one or two up and trying them, but once again I think the same argument applies to me as stated above. Now you see, had you never owned a W&N brush, you probably would be okay with the Rosemarys. Now you know the difference, you're hooked, and you're happy about it, too. Me? Still using whatever looks good from the local craft store. You've got me interested, so I'll be checking out the Rosemarys. Thanks for the pointer. Yes, the brush needs to be in perfect condition to perform as it is designed. If you're not taking proper care of it then it's a real waste of money. I have two Series 7 Miniature brushes a 0 and a 00 (I think). Basically the point is shorter and sharper, making it ideal for the really small detail work. I might post more about my collection of brushes since this is obviously a subject that matters to a lot of miniature painters.